The only resolutions I’m making this year are kitchen resolutions. Positive resolutions – they’re “I will” declarations, not “I won’t”. In thinking about what I want to accomplish in the kitchen this year, I realized that many of these resolutions are about getting out of my comfort zone and facing projects that have intimidated me in the past. That’s one of the many things I love about cooking – it’s a regular opportunity to stretch our comfort zones. I’ve learned that life on the other side of our fears is well worth the discomfort and anxiety of working through them. I can’t imagine what my life would be like if I hadn’t taken a chance on some big life decisions, like changing careers (several times), committing to a long-distance relationship, moving across country (twice) and deciding to make a living as a freelance writer. Even small yet momentous decisions like traveling solo abroad, hiking on exposed scary mountain trails or rappelling down canyon walls made me the person I am right now. And I like that person! Making small changes to your routines and conquering tiny obstacles prepares you for the big scary changes you really yearn to make. Angel’s Landing trail, Zion National Park. My palms still sweat just looking at it. None of us like to fail, even though we know failure is good for growth. We like to feel competent, so failure, no matter what, is a bummer. When you think of yourself as a competent cook, you don’t always try recipes or methods that might shake that competence, especially if other people are depending on you for dinner. But I want to stretch. I want to I will try things I’ve always avoided doing in the kitchen. I also want to be more creative in the kitchen. Maybe my baking background is to blame, but when I’m cooking I usually refer to a recipe on my nearby laptop — unless it’s pasta or something I’ve made several times before. I often adapt the recipe to my taste as I go, but a recipe is usually the starting point for me. This year, I will trust my kitchen instincts more often and start with an idea instead of a recipe. If I need help developing the recipe, I’ll seek it, but I’ll start with a blank page and fill it in with my ideas. I expect to fail, but I also expect to make some really good dishes to share with you. Here’s what else I’m taking on this year – my 2015 kitchen resolutions. Even though I went to pastry school and worked in a pastry shop for a year and a half, I’ve never made biscuits from scratch, or at least I don’t remember ever having made them — those pastry years are a blur. Now that I live in the South, I will pass that culinary bar. I feel an intimidating sense of responsibility when it comes to canning: if I don’t get temperatures, times or sanitation right, I might kill people. I know that’s a bit dramatic, but I guess all those sanitation classes back in my restaurant days left their mark. But this year, I will can. Besides, how else will I get the preserved lemons I desperately want? Yeah, that’s an obscure one, but preserved lemons reminded me that another ingredient I can never find locally is pomegranate molasses. This winter, I will buy pomegranates and make molasses myself. Grilling is Jim’s domain. I know, how cliché, the man grills, the woman bakes. But our cliché cooking relationship is based on my residential history. I lived in apartments my entire adult life until I moved to Sacramento. But even in Sacramento I never grilled. I obviously have grilling issues to overcome. No more excuses, this year I will push Jim aside and burn some meat on our charcoal grill. We recently bought a meat grinder attachment for the mixer to make ground venison for burgers. And lordy were they good. Next on Jim’s list – venison sausage. But why can’t that be my list? And why stop there? This year, I will make my own sausage, maybe breakfast links or, oh, yes, now I’m getting excited — linguica! 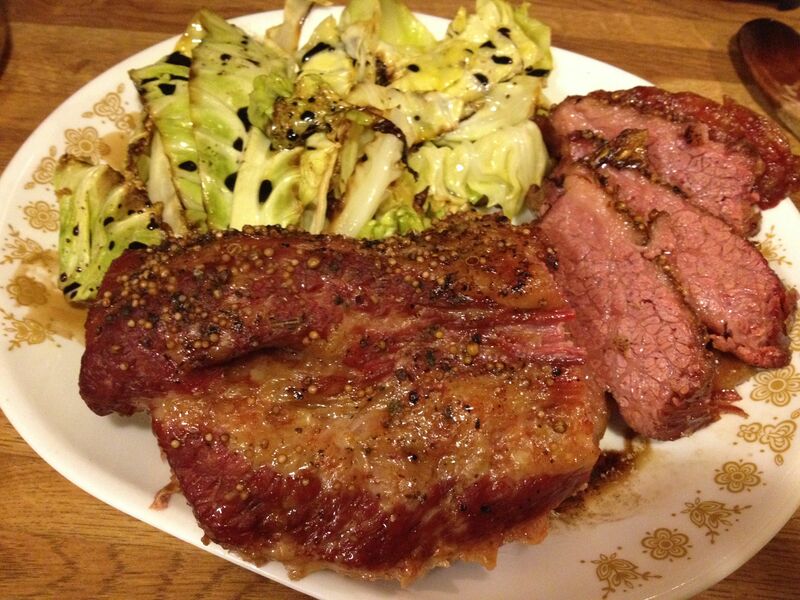 When I asked Jim what he wanted for his birthday dinner, he chose corned beef and cabbage. I chose a Ree Drummond (aka The Pioneer Woman) recipe. It was fantastic. While it was cooking, I read some of the hundreds of comments on her post and a few mentioned their repulsion at using a supermarket piece of processed meat. They also mentioned using Alton Brown’s brining method to make it from scratch and I thought, hmm. This year, I will “corn” my own beef. Like most Americans, I buy my chicken in parts, usually boneless, skinless parts. It’s time for me to stop being lazy, save money and gain self-respect. This year I will start buying whole birds and breaking them down myself. I can’t remember the last time I roasted a chicken or any other bird. Well, I do remember – the chicken was in California, and the turkey was on an island in the Puget Sound – both more than six years ago. We never host any “roasted bird” holidays so this year I will create an occasion to pop a bird in the oven, and make some dressing and gravy. I haven’t made pasta from scratch in over ten years. At least. Watching a Lidia rerun the other day reminded me how easy it is once you start doing it regularly. It’s time to retrieve my pasta maker from storage because this year I will make pasta. I’ll start my pasta making with tagliatelle and ravioli, but eventually I will try my hand at gnocchi – a good excuse to buy one of those cute wooden gnocchi boards. And then, I’ll make ricotta cheese. I once made paneer for an Indian dinner at my house so I’m thinking ricotta should be just as easy. I have visions of scrumptious fresh ricotta on toast with berries or jam. And that toast will be homemade whole wheat. I used to have bread-making phases when I lived in Arlington, but it’s been more than ten years since that particular urge has hit. Funny enough, I have two loaves of marble rye rising right now because I want to make a corned beef Reuben and you can’t have a Reuben without rye bread. Already we have proof that writing down your resolutions (or goals) makes it much more likely that you will achieve them. I found a recipe for carrot cake power bites that calls for almond meal. Do you know how much almond meal is at my supermarket? $12 for a small bag from Bob’s Red Mill. No thanks, I’ll grind my own somehow. So that’s one project. I’ve also seen lots of tempting recipes using cashew cream – another creative use of nuts. And, I’d like to make my own almond, hazelnut, pecan, walnut or pistachio butter for that future loaf of homemade whole wheat bread. The foraging trend gives me permission to honor my frugal, resourceful side. For example, every fall a ton of hickory nuts fall on the ground around our house. There must be something I can do with them! And what about dandelion greens? As long as Jim doesn’t spray them with some icky chemical, I’d love to sauté some for dinner. I’m sure there are more good eats out there in the woods. Don’t worry, I won’t take any chances – no mushrooms ever. And no squirrel stew either. What about you? What kitchen projects have intimidated you in the past that you’re ready to tackle in 2015? Love this! Thanks for the inspiration to tackle those kitchen projects I’ve been putting off. Peanut butter is one I’d like to tackle, as is making our own cheese and rice wine – but the biggest thing I want to do accomplish in my kitchen in 2015 is learning how to can. We’ve inherited some supplies but I’ve been afraid I’ve blow my kitchen up or the stove would short circuit. Peanut butter is on my list too, but canning is the big one. Let’s hold each other accountable. First step for me is buying the supplies. And I’m going to treat myself to two books: the Ball book (http://www.amazon.com/Ball-Complete-Book-Home-Preserving/dp/0778801314) and Andrea Weigl’s newish book (http://www.amazon.com/Pickles-Preserves-South%C2%AE-cookbook-Cookbooks/dp/1469614405). Ordering those right now — aren’t resolutions fun?